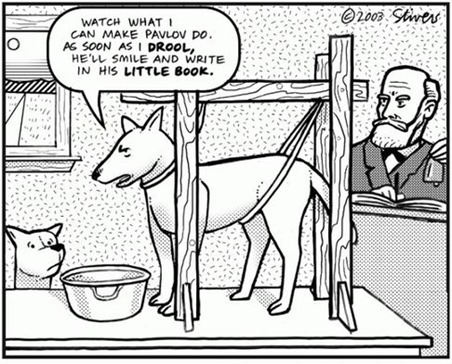 We are all familiar with Pavlov’s experiments with dogs that showed that if they were trained properly the dogs would react to an associated stimulus just as easily as the thing itself. This is the Conditional Reflex, the dog starts to salivate when hearing a bell, rather than seeing or smelling the real food. Investors, for the past day or two seem to be reacting in a similar fashion to Fed. speak. Janet Yellen , demonstrable, said nothing at all other than saying that a “considerable period of time” passes with patience. It is quite remarkable that we should get a 700+ point rally out of that as I know of no one in the biz that knows what patience is. Ergo it must be a conditional reflex. This brings us to the question of who is a captive of whom. Are investors so captivated by Fed speak that that has become some sort of binary switch, or is the opposite true, that it is the Fed, so compromised by previous rhetoric that it is, in fact, the captive of the investing public. This is a phenomenon that is akin to the Stockholm Syndrome , where the hostages and perpetrators more or less switch roles and paradoxically become very friendly with each other. The Fed. is now obsequious and excessively eager and attentive to please. As a result it’s role may be substantially diminished. Three dissenting members do not help either.